Bronwyn worked really hard cleaning and tidying the house. We've thrown out about 5 sackfuls of assorted junk. We're slowly working through the house clearing things out. It'll take a while. Everyone goes on holiday after Christmas. We delay it a bit. I've been working hard trying to get everything finished. Off camping tomorrow. Usually it'a a gamble whether we'll fit all the stuff in one car. Now we're not sure if we'll squeeze into two! Brenda arrived a week ago, and has been enjoying life on the farm and settling in. She's been introduced to most of the family, and did a couple of trips into the city. Our kitchen has never been cleaner. My mum arrives next weekend. It's her first time outside Europe. And we've been attempting to tidy the house. We've filled three sacks full of assorted junk. Bronwyn spent ages tidying Sarah's room and sorting out her clothes and toys. I've vacuumed places that haven't seen daylight for years. We've planned a trip up north camping, a weekend down in Queenstown, and another trip to Rotorua. Between those three, that covers a large chunk of New Zealand. But most of the time she'll be here on the farm. It's been warm and humid. Allan's grown sweetcorn again, and he's had the sprinklers going most evenings. I've got carrots, beans and lettuce coming on nicely, but I didn't bother with all the rest this year. Dear all. Welcome to the news of 2013! As the end of year is fast approaching, it�s time for me to sit back and look over the past twelve months and everything that has been going on. Again it has been a busy but wonderful year, full of God�s blessings. 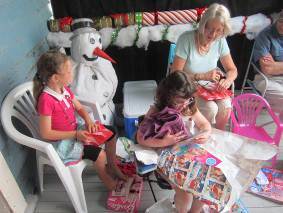 We had the annual extended family Christmas gathering at our house this year and we set up the front porch as a �grotto�. We had a large real tree with �snow� all around, Christmas lights and even a snowman made from chicken wire and an old duvet inner. It was too hot to be inside so we moved out to the porch steps and front lawn and opened our prezzies there. Near the end of January we headed down to a small east coast township called Omokoroa for our annual camping holiday. Wonderful smallish camp ground with great facilities including a pool. Had a brilliant time! Tim came with us and then carried on to Hamilton to go to the Parachute Music Festival before heading back to be with us for the last night. It was a lot of driving for him!!! We have already booked �14 camping holiday. We�re heading back up north to Ruakaka. We are all looking forward to going camping, especially Rachael. 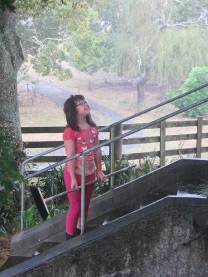 She has been wanting to go back to Ruakaka for the past several years. This camp will also be very special as we will have Tim�s mum with us. She is coming over in January for the first time and will stay with us for about 6 weeks. We are really looking forward to her first visit out here and have already bought a camp bed for her (just for the camping trip � she can have a real bed in the house). After a busy year last year with HelpX, this year we have purposely been quiet. Nana returned for a week before heading back to China. It was really good to see her again. We also had Caitlin (USA). 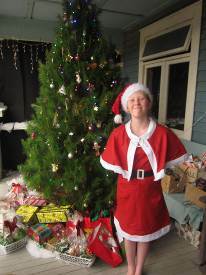 Erica (who had come to stay with us last year) returned to NZ in August to do her Pre-school teacher training. She stayed with us for several months while she attended language school and got a great IELTS mark in the exam. We now say we have three daughters! She is now living about 30 mins drive away and is already neck deep in study and enjoying it! Recently we had a couple from Czech Republic stay. It is always great to be able to show people around the farm and let them see & feel the animals. In early May (in the school holidays), we headed up to the far north on a road trip. It was a wonderful week away where we spent quality time as a family and saw/learnt a great deal about our wonderful land. We headed up north and across to the west coast and spent our first night in Dargaville. Being at the top of the Kaipara Harbour it has amazing history. Day 2 we headed up the west coast and saw Tane Mahuta � the largest Kauri in NZ. We also stopped to help a family whose car had got a puncture and found that they were closely related to a friend here in Waimauku � small world. We carried on up to Kaitaia and the next day we did a bus tour up to Cape Reinga (the tip of NZ) via Ninety Mile beach. It was really freaky driving along the beach with big waves rolling in. We left the beach and headed up a creek bed stopping to go sand surfing down the big dunes. 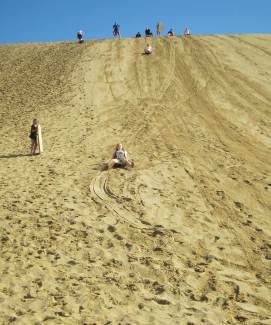 The tour bus had toboggans ready for everyone to use but it was a hard climb to the top of the dune. Well worth it though!!! (The photo is Rach coming down.) Our last 2 days were spent over on the East Coast at the Bay Of Islands. We went out on a boat tour and saw several pods of dolphins � totally awesome! We have had a few orphan lambs come through this winter but one stands out. We called him Zeus and he broke every rule about survival. He was born with Spina Bifida and was still alive and when dad found him in the morning. He had almost no use of his back legs but would flop around to move and was full of life. 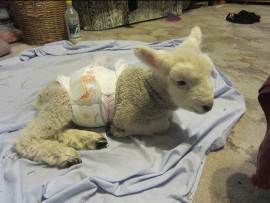 We bought nappies to put on him so that he wasn�t lying in his urine all the time. Unfortunately he developed a growth in his tummy and died several weeks later, but he was amazing! Earlier this year, NZ held a census. I got a job as a Collector, delivering and collecting census papers. I was then asked to carry on for another few weeks as a Special Collector chasing up late papers. It was a lot of driving in very hot, dry weather but I met so many interesting people. In April my nephew started school. As they live next door and both Claire & Nigel work fulltime; I offered to look after him after school. So 3-4 days a week Cooper gets off the bus with Sarah and we do all sorts of things. The other day he made a lovely mosaic racing car. Rach became a teenager back in May. Now she keeps telling me that in three years she�ll be legally allowed to drive. I like the �legally� bit� Rach has just sat her end of year exams at school but doesn�t finish for the year for another four weeks. In two weeks time she moves up from Guides to become a Ranger. It will be the first time in 25 years that the district has had a Ranger Unit. She loves Guides and especially the camps. In June they had their winter camp and it rained almost the whole time � and they were in tents! In late August I took Rach down to Mt Ruapehu for a �Snow weekend�. Unfortunately the ski fields were closed due to really bad weather so we drove across to Rotorua for the last day before heading home. It�s one of her dreams to go to the snow, so this was her (belated) birthday present. 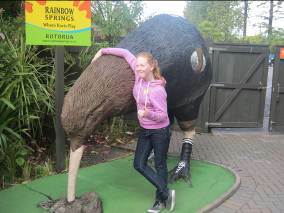 Still, we had lots of fun in Rotorua. Definitely one of the places to take Tim�s mum when she�s here. Sarah has had a bit of a tough year. In July last year she had a change of teacher and we became aware of how far behind she was in school due to her poor eyesight. This year her teacher has been great but tough on her. If she can�t see something properly and hasn�t done the work but hasn�t said anything � tough luck. But on the other hand, her teacher has been enlarging worksheets and has had an iPad in the room just for her. They use the camera and enlarge pages etc. She has made great progress and now has yellow tinted glasses to help her � the tint stops the words �jumping around�. Just over 2 weeks ago at Agricultural Day, Sarah won the overall prize (and trophy) for her Chicken Rearing Diary and research project!!! Tim has had quite a few changes at work. Watchdog (who had bought out the original company two years before) decided to sell the business to the Aussies. Meanwhile, Tim�s old boss Dave approached him with plans to start another business together. This was a big step for Tim, who has only ever had two jobs in his career. After a few months changing over, Tim is now working from home four days a week (and the other day at Dave�s). They are still contracting to the Aussies to support them, but they�ve got a growing list of new work, so Tim has been busy! He�s also now treasurer for two charities, and has been learning all about wages and tax. So far so good, and we�ve been able to replace both cars at last! With Christmas fast approaching, Tim is going to be getting very busy with the brass band � playing in four Christmas parades, three Carol concerts and caroling outside a supermarket up till Christmas Eve! "This is just between you and me"
"This doesn't leave the room"
"This doesn't leave the table". It started with The Saga at Watchdog, which had been simmering for a while, but came out with the announcement that KnowledgeNet had been sold to the Aussies. There followed a few months of me working part time for them and also for Dave, who used to be my boss and had left last year under circumstances which will remain under wraps. Or preferably buried on a windswept island somewhere south of Stewart Island. We've also had a Very Interesting Year with the youth work at the local college, which has left me as treasurer and anticipating a huge change in direction next year. I've lost track of who knows what and how much I can say to anybody. Which is fortunate because I don't talk a lot. Turns out that Dave's poor dog has also been put down. I remember Pepper from when I first worked at his house. Very quiet dog. I'd be sitting, focussed on the laptop, and suddenly notice a rather doggy smell coming up from under the table. But once Rhea came along, they'd bark furiously at just about anybody walking past. Pepper went downhill fast, and her lungs were full of cancer. Dave was really upset. Sarah has done really well at school this year. Since they gave her yellow tinted glasses, the letters have stopped jumping around the page, and she's been able to learn to read and write. She's almost caught up with the others. Meanwhile Rachael is doing well in just about every subject. Hopefully she'll be in the accelerator class next year again. Ten days until Christmas. Baking hot and humid. Three sessions to go playing carols outside the supermarket, one carol concert at another church and one session on trombone at my own church. I can play most of the carols blindfold. Buried our dog today. She had cataract and glaucoma, and arthritis. The medicine had eased it a bit, but she wasn't her old self. There comes a time when all that's stopping you from letting go is your own selfishness. Today we let her go. We tried to give her the best weekend we could. I'd combed out all the matted hair as much as she'd let me, and given her a bit of a trim. We took her out to the beach, the whole family together. I had to leave early. I turned round as I left the beach, and saw them several hundred metres away, walking off into the distance together. I like that memory. That evening, Bronwyn cooked up some best steak and gravy, and Princess wolfed it down, along with the last of the dog food. The vet came round early today. He hung back as Princess picked up an old tennis ball and dropped it for us. One last ball. Ross came round to help out. As the vet said, "She's gone", I'm fairly sure I heard the tough old farmer give a whimper. We buried her in one of her favourite spots, beside the house, under the sign saying "Watch out, Border Collie about". Bron and Rach are off now buying something to plant there. They say that a dog can't hear commands beyond about 70 metres. I can remember her barrelling down the hillside from at least 150 when I called out her name. She never did get the hang of herding sheep. But she'd always want to jump up on the tractor to have a ride. At night, she'd sometimes let off this eerie howl. She did it just last week. As if she was calling, calling. Princess was born pretty much when we arrived here. A whole lifetime for a dog. A whole chapter in our lives. Both good and bad. Princess was there when we came home with Sarah in our arms. And Princess was there when the ambulance came up the drive. More than once. A whole chapter. Where next? Much has happened, and this last year or two has seen a big turnaround for us. I think there's more for us here yet. And much that we've been able to let go.